I have been a vinyl addict since my early teens in the late 1960s and have continued to collect records as the opportunity presents it'self. My regular turntable for the last 12 years has been a Garrard 401, in original, unrestored condition, with a Rega RB1000 arm and a mixture of cartridges. 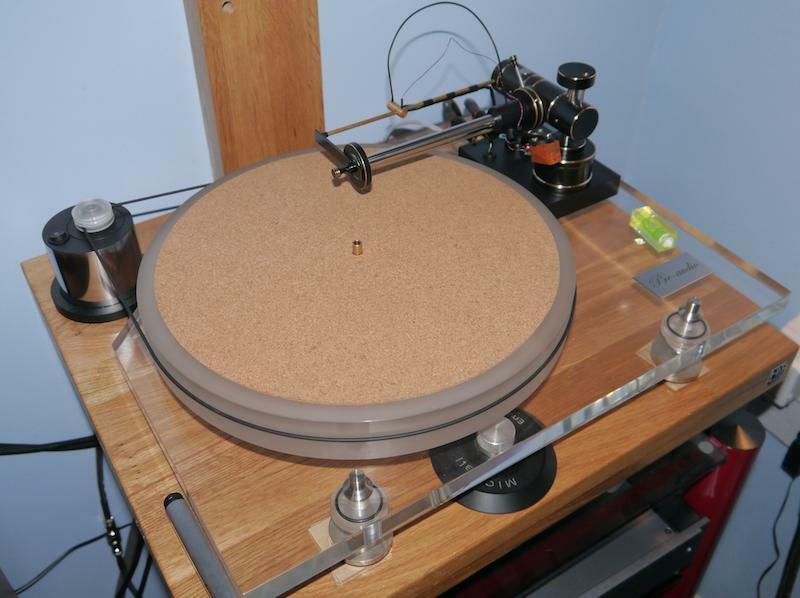 Last year I was lucky enough to review the Zontek turntable and it made me realise that perhaps it was time to refresh the Garrard or perhaps replace it! Don't panic, I still have the Garrard and will never sell it, though if funds permit it might get a bit of restoration. Following on from the Zontek review, the UK distributor GPoint Audio (Greg Drygala) suggested I listen to the range of turntables from Pre-audio, a new company to me, based in Poland. The unique selling point for all the turntables is the use of a tangential tracking, air bearing tone arm. This is not new technology, as those older readers will know, getting such tone arms at a reasonable price has seemed an impossible dream until now. I know there is the odd tangential tracking arm available from enthusiastic amateurs, but to me they do look a bit agricultural. The ASP 1501 comes well packed in two large boxes, one containing the turntable and the other the air pump and power supply for the motor. You must allow plenty of time for unpacking and setting up as it is much more involved than with a regular turntable. The first essential item to aid setup is a spirit level as the turntable must be level. With a regular, radial tracking turntable if it is not level it does not have a massive impact. The Pre-audio turntables must be level for the air bearing arm to work correctly, so spend plenty of time getting it right. Next up, get the pump and power supply in position. Now connect the power cable to the motor and compressed air tube from the pump to the arm. The compressed air tube includes a filter, and there is direction arrow showing which way round to connect the tube. With all the big bits in position you are just left with positioning the motor. It surprised me that there was no advice on how far to place the motor from the centre of the platter. I placed the motor in what looks the right place and it seems to work with no obvious speed instability. It would be good if Pre-audio added a note in the handbook on positioning the motor. The next critical step is fitting the cartridge, then setting the tone arm height so the top of the cartridge is parallel with the record. You do first need to get the tracking weight approximately correct by sliding the balance weight backwards and forwards, don't get too carried away for precision at this time as the final adjustments will come later. The detailed setup process is described in the manual so follow the guide to setup the arm height or VTA calibration. Assuming the turntable is level you must next level the arm bearing, Pre-audio supply a small spirit level to aid this operation. Next task is the overhang, this is adjusted by moving the arm tube backwards and forwards so be careful to check tracking weight afterwards. While adjusting overhang care should be taken to ensure the azimuth alignment is correct, that is when looking at the front of the cartridge the top surface is parallel with the record. The final alignment is to ensure the cartridge front face is parallel with a raduis line from the centre of the platter. Now you can finally tweak the tracking force to the optimum value for your cartridge. There is one final bit of setup to do and that is the arm lift, this is done last as it depends on the arm height setting. 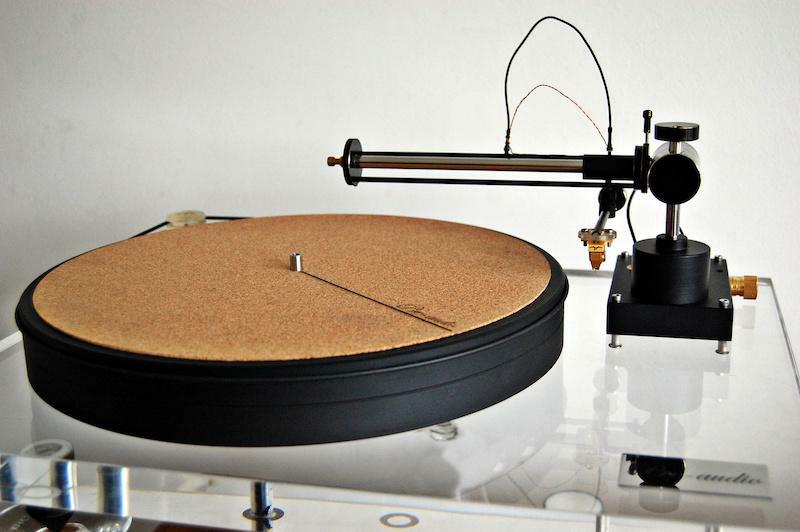 If this all sounds too complicated, you can purchase the turntable with the cartridge already installed, you just then need to check the tracking force and you are ready to go, not forgetting to set the turntable level first. When you turn on the power to the pump and motor the big surprise is the lack of pump noise. In my setup the pump is positioned on the floor below the turntable shelf, a few feet from my seating position, and I can hear nothing from the pump. The motor is an AC synchronous type which spins the platter up very quickly, within 3 seconds and quicker than I can move my hand from the on/off switch to the arm lift/lower lever. There is some vibration of the motor body though this in no way seems to feed through to the platter and arm and therefore impact the sound. 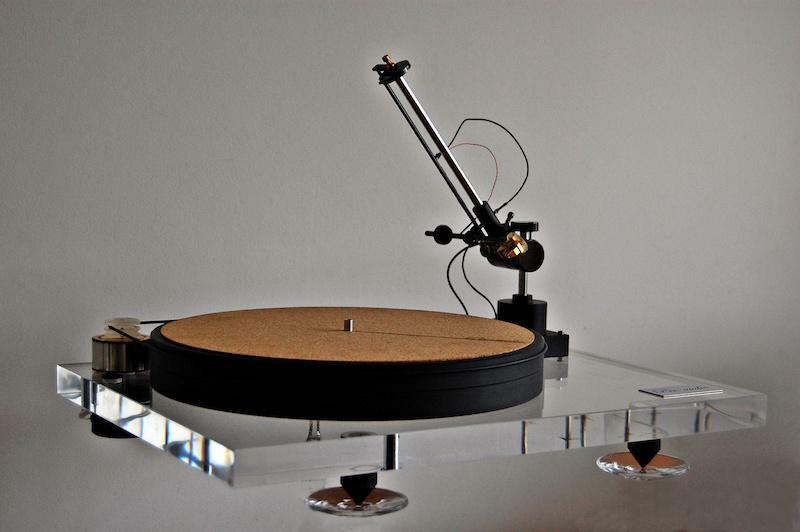 Now everything is setup, just take a couple of minutes to set back and admire the turntable. I hope you will agree is looks fantastic, the clear acrylic chasis looks better to my eyes than the more expensive models that use granite. The three pictures above are all stock images from Pre-audio and look like an earlier preproduction version. My review sample that you can see below is slightly different, with the motor separate from the chassis, sitting directly on the shelf. Operating the ASP 1501 is very simple, with power applied to the pump/PSU the air feed to the arm is running. Turn on the motor using the switch on top of the motor and the platter spins up quickly. Gently slide the cartridge over the lead in groove then lower to start the album playing, no different to a regular arm. The first surprise is how quiet the groove noise appears to be, quieter than my regular Garrard turntable. The second surprise the tracking stability, from the first track through to the end of the side the Benz Micro Wood tracks perfectly. When you first look at the arm and compare it to my regular Rega arm it looks a bit flimsy. A lot of effort is put into regular radial tracking arms, to achieve high rigidity, with low friction bearings and low arm resonances. The ASP 1501 arm seems to go against all those norms, yet the result is spectacularly good. The arm tube is a solid carbon fibre rod, so it should be rigid and well damped. Every album I played seemed to reveal new depths I had not heard before. Even my old, and well worn David Bowie Hunky Dory seemed to gain a new lease of life. Another of my favourites, Don McLean and American Pie, sounded much cleaner with quieter background noise. The speed stability of the ASP 1501 is excellent, delivering very good rhythm and timing, foot tapping just came naturally as Don McLean sang about the king and the jester! Another of my favourite artists is Ella Fitzgerald and her recording of the Harold Arlen song book, a modern pressing from Speakers Corner Records. The recording does show its age a bit but Ella shines through, dim your room lights, close your eyes and Ella is there in the room with you. Owning a good vinyl system is like having a time machine, you are transported back to the time and place to sit alongside the artist! No replay system is perfect and one aspect the Pre-audio ASP 1501 seems to accentuate what I call pressing wow. This is where the pressing has the hole off centre, this is more obvious with the tangential tracking arm as you can see the cartridge moving left and right as the record rotates. It must be the same with a radial tracking arm but not so obvious and this seems to come through with the sound, the wow this introduces is easier to hear. It does not detract from the musical enjoyment, it is just part of the character. Most importantly the ASP 1501 introduces no obvious wow of it's own. Top to bottom, the ASP 1501 delivers a clean sound, with little obvious colouration or resonances. My Garrard definitely has a characteristic sound, probably because of the wooden plinth and perhaps the old, worn bearing! The time machine took over again and out came the Steely Dan album Aja. This album needs a turntable that allows the rhythm and metronomic timing to show itself and the ASP 1501 does this. The pressing is good, no pressing wow, and in spite of the age of the album (1977) it sounded as though it was recorded yesterday and not 39 years ago! I also have this album in digital format but still prefer the vinyl. The digital transcription seems to rob the recording of life and spontaneity. Recently I have acquired a couple boxed sets of albums, the complete Columbia recordings from Simon and Garfunkel (5 albums) plus bob Marley and the Wailers the complete island recordings (11 albums). Both boxed sets have been remastered from the original master tapes and pressed on 180 gram vinyl. These albums are about as good as you can get, I thoroughly recommend them. Playing these albums on the Pre-audio ASP 1501 the sound just blows the digital versions into the weeds, Bob would know about that ☺ . To get better you would need copies off the original master tapes on 1/2" tape at 30ips and a very expensive reel to reel tape player. As you have gathered by now I like my vinyl replay system and in particular the Pre-audio ASP 1501. Once setup the ASP 1501 is very stable, there is no suspension to go out of tune. The UK dealer tells me he loves taking Pre-audio turntables to shows as he just takes them out of the packing case, levels them up and that is it, they sound as good as the day they were originally setup. 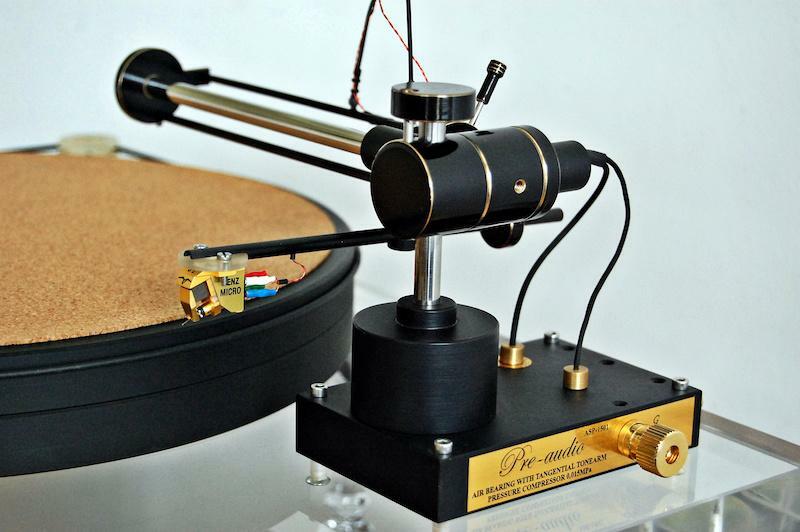 The setup procedure is time consuming and complex, I recommend buying the turntable with a cartridge or ask your dealer to fit the cartridge for you, then install the turntable. The sound quality is superb, really clean with a good sound stage and great timing. It is so good I had to buy the review sample, apparently I am the second reviewer to do this!